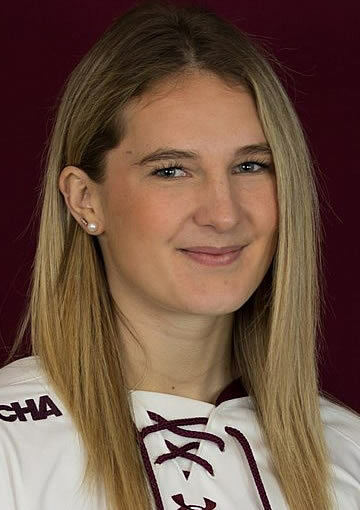 BLOOMINGTON, Minn. – Jan. 22, 2019 – Following Week 16 of the 2018-19 season, the women's Western Collegiate Hockey Association (WCHA) is proud to recognize four student-athletes as the WCHA Players of the Week, Powered by GoodWood Hockey. The honorees for games of Jan. 18-19 are: Minnesota Duluth sophomore Naomi Rogge (Forward), junior Maddie Rooney (Goaltender) and freshman forward Gabbie Hughes (Rookie) and Minnesota junior Patti Marshall (Defenseman). 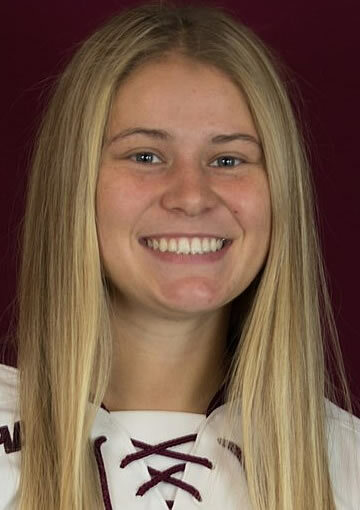 Sophomore Naomi Rogge figured in eight of Minnesota Duluth's 11 goals against No. 5 Ohio State and led the NCAA and WCHA in points (8), goals (4) and assists (4), as well as points per game (4.00). Rogge opened both games against the Buckeyes with first period goals and netted a pair goals and an assist in the opening 20 minutes of Friday's game. Saturday, the sophomore forward recorded a goal and an assist in the first period before netting her fourth goal and assist of the weekend later in the third period. This marks the second series this season Rogge has led the NCAA and WCHA in scoring. Rogge compiled four goals and an assist for five points back on Oct. 19-20 against Bemidji State. This is Rogge's second WCHA Forward of the Week honor this season. Honorable Mention: Nicole Schammel, R-Sr., Minnesota (contributed to all four of Minnesota's goals in its split with No. 1 Wisconsin, scoring three times with one assist); Brittyn Fleming, So., Minnesota State (scored the game-winning goal against Bemidji State in Saturday's Hockey Day Minnesota contest and finished +2 on the weekend); Laura Kluge, So., St. Cloud State (tallied a goal and an assist in St. Cloud's 3-1 win over Minnesota State on Friday). Junior Patti Marshall recorded a pair of assists as Minnesota split with Wisconsin over the weekend. Marshall picked up the second assist on Nicole Schammel's game-tying goal in game one, and she again set up Schammel in game two, assisting the game-winning goal with her 14th assist of the season. Marshall was tied for the scoring lead among WCHA defenders with two points, two assists, 1.00 assists per game, and 1.00 points per game. She led WCHA blueliners with a +4 rating in two games over the weekend. Marshall helped the Gophers defense hold the Badgers to just 1.50 goals per game after Wisconsin entered the series averaging 3.91 goals per game, along with helping the Gophers go six-for-seven on the penalty kill against the Badgers. Among NCAA defense, Marshall was tied for second with two points. This is Marshall's second WCHA Defenseman of the Week honor this season. 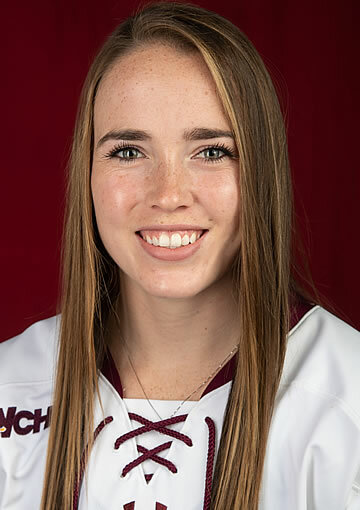 Honorable Mention: Anna Wilgren, Fr., Minnesota State (recorded and assist, five shots on goal and seven blocked shots as the Mavericks split a pair of games with St. Cloud State and Bemidji State); Maddie Rolfes, Sr., Wisconsin (scored the game-winning goal in the Badgers' 2-1 road win at No. 2 Minnesota on Friday). Maddie Rooney helped the Bulldogs sweep fifth-ranked Ohio State by posting 75 saves on 80 shots, including 39 saves Friday night in UMD's 5-2 win. Rooney's 75 stops led all WCHA goaltenders and ranked second nationally on the weekend. Her 119:42 minutes of action led all WCHA goaltenders in minutes played. One of only six goaltenders to earn a series sweep this weekend in the NCAA, Rooney also was the only WCHA netminder to pick up two wins. This is Rooney's third WCHA Goaltender of the Week honor this season. 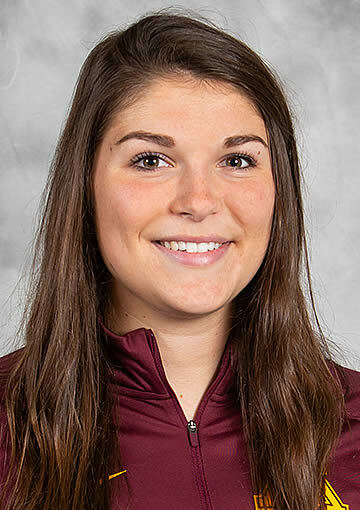 Honorable Mention: Sydney Scobee, Jr., Minnesota (made a career-high 37 saves on 38 shots in the Gophers' 3-1 win over No. 1 Wisconsin on Saturday; led the WCHA with a .974 save percentage and a 1.00 GAA on the weekend); Abigail Levy, Fr., Minnesota State (Stopped 38-of-42 shots as the Mavericks split a pair of road contests with St. Cloud State and Bemidji State). Hughes led all WCHA rookies, as well as the NCAA with four points against No. 5 Ohio State over the weekend. With an NCAA-high 15 shots, two goals and game-winning goal, Hughes and a goal and the game-winning assist Friday in UMD's 5-2 win over OSU. The rookie again had a goal and assist in the Bulldogs 6-3 win Saturday, including the game-winner at 2:53 of the third period. Hughes leads the Bulldogs with 24 points in 22 games this season (13g, 11a), and ranks fourth in the NCAA for points by a rookie and first in the WCHA with a 1.09 PPG average. This is Hughes' second WCHA weekly honor this season. She was previously recognized as the league's forward of the week on Jan. 8. Honorable Mention: Abigail Levy, G, Minnesota State (Stopped 38-of-42 shots as the Mavericks split a pair of road contests with St. Cloud State and Bemidji State).